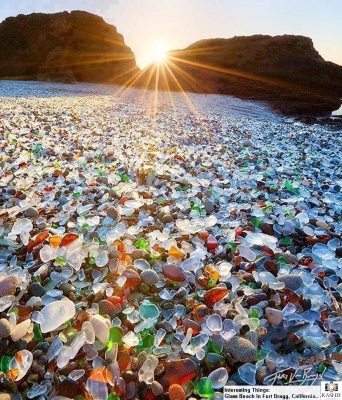 Glass Beach can be found near Fort Bragg in California, USA. The once normal beach lies just South of an area used as a dump site between 1949 and 1967. In 1967 the California State Water Resources Control Board closed the dump and various clean up programmes were carried out in order to restore the area. The metal from the dump was removed and over the following decades everything that was able to biodegrade, did. 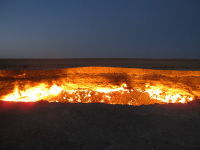 Eventually all that was left was glass at the dump site. The glass was eventually turned into what is known as 'sea glass'. The constant battery from the waves and sand of the beach rounded all of the edges of the broken glass and made it smooth. The glass now has the appearance of shiny colourful pebbles. Two neighbouring beaches were also contaminated with the glass shards, which are accessible from the same road that leads to Glass Beach.